Selected for KALEID 2016 Collection of European-based artists’ books with a curated exhibition and seminar in Norway at Kunsthøgskolen i Oslo (Oslo National Academy of the Arts), 11 – 13 May 2016. Repetition & Recollection… is inspired by Søren Kierkegaard’s insightful dialectic from his 1843 book, ‘Repetition’ and is the essence of this book. Repetition and recollection are the same movement, only in opposite directions: for what is recollected has been, is repeated backwards, whereas repetition properly so called is recollected forwards. Tactile words flowing in opposite directions across the folded pages echo the back-and-forth play between repetition and recollection. Recollection is confined to the past; or is it bringing the past into the present? Repetition, on the other hand, is in constant forward motion; or is it connecting the past to the future? Kierkegaard’s paradox remains. Double-sided concertina format 170 x 120mm; letterpress printed in Bembo; foil-blocked covers. Produced by Book Works, London. Participating artists: John Court, Tony Orrico, Michel Platnic, dolanbay, Michael Namkung, Vera Martins, Daniel Ben-Hur, Judith ann Braun, Stuart Brisley, Robert Luzar, Kimbal Quist Bumstead, Katrina Brown, Ram Samocha, Hannah Turner Wallis, Nazir Tanbouli, Sally Madge, Jane Grisewood, Carali McCall, Maryclare Foá, Birgitta Hosea, Diogo Pimentão. Draw to Perform curator Ram Samocha invited 20 artists to participate in the event, 10 giving live performances, including Carali McCall and myself. With cameras strapped to our bodies, we repeatedly marked the wall with charcoal and graphite as we moved back and forth throughout the 30-minute duration of the line dialogue performance. The 3-day symposium included evening video screenings as well as live drawing performances and discussions led by Ram Samocha, Nick Kaye, Professor of Performance Studies, University of Exeter and selected artists. Samocha writes: ‘The symposium will concentrate on the connection between performance art and drawing and the relevance of drawing as a modern medium. 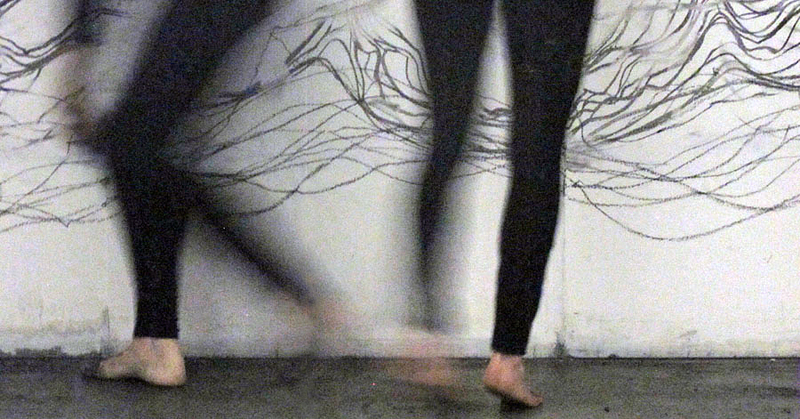 The symposium includes video screenings, live drawing performances, talks and lectures by artists and art historians.This symposium aims to promote the growing stream of live drawing performance, to distinguish it as a unique entity and allow it to rise from the eclectic, wider definition of performance art. In the high altitude of the Chilean Andes, the cloudless sky revealed a dazzling canopy of stars as night fell over the Atacama Desert, a stargazer’s paradise. Standing on the summit of the aptly named Cerro Tololo, ‘mountain in front of the abyss’, and surrounded by the imposing white observatories in the dark cold atmosphere, there was one star that captivated me – Sirius – the brightest star in the night sky, and visible in both southern and northern hemispheres. Hypnotised by its brightness and movement I spent most of the night with a handheld camera intent on following this one dominant star. The random choreographic gestures of my arms, like drawing in the air, created lines of light, ephemeral ghost-like threads danced across the sky as each one became suspended in time in my camera. Separations exhibited at Eagle Gallery, London, includes 9 prints (33 x 33cm, Giclee printed on 300gsm Somerset paper); 8 special edition cloth-covered solander boxes with books and 11 s/s prints (17x12x2cm); and individual books (24pp, 15x10cm), produced by Book Works.